Increase your chance of success by 1100% and become virtually UNSTOPPABLE! The very SECOND you add this ONE QUALITY, you'll race faster to your goals than you ever thought possible. I always think of you, my customer, as a friend. As I do with all my friends, I consider it my job... no, my responsibility... to get breakthrough information into your hands, and mind, information that can help make your life MUCH better. Someone recently asked me which of our courses is the most helpful. That question made me think through all of the courses we offer. I realized that the answer to that question was simple: ALL OF THEM! You see, we consider our courses to be like tools in a tool box. One tool alone doesn’t work for every project. It takes all of them to complete the different jobs that come along. The same is true with our courses. No one course addresses the full spectrum of challenges we face every day, nor do just a few. It takes many of them to give us the information and knowledge we need to get us where we want to go in life. While it may seem unrealistic to buy every course I write about, I honestly believe that the person who does buy, and use, every one is the person who is in the best position to live the most fulfilling, rewarding, healthy, and abundant life possible. So it is in the spirit of helping you live a better life that I offer another useful and critically important "tool." I know you want to do more, achieve more, help more people, and have more. Right? And that tells me you are already a pretty disciplined person, willing to sacrifice to achieve your goals. That quality of discipline will get you far in life. Yet, you can get even further. MUCH further. You can spend years learning scores of proven success principles. Thoughts, plans, and actions that enable you to achieve your goals... to finally get healthier... or make a mark in your career that leads to a bigger paycheck... or become more of a vital role in your relationships—a better parent, spouse, and friend. But the very SECOND you add this ONE QUALITY, you'll race faster to your goals than you ever thought possible. It's the foundation of your character, your achievements, and your happiness. Giving you an unshakable confidence, a rock-solid character, and a never-give-up spirit to learn, grow, and fulfill your potential. What is this indispensable quality that fuels your most fulfilling future? Brian Tracy calls it Self-Mastery. Self-Mastery is the ability to make the most out of your physical, mental, and spiritual health. To be the best you can be... At everything. At this elite level of self-discipline, you master your own fate. You've already taken the tough steps to reach a level of discipline for respectable success. Starting today, you can quickly—and surprisingly easily—ratchet your discipline to reach a level of achievement only attainable by the world's Elite 2%. That's the difference between average discipline and self-mastery! Brian Tracy, world-acclaimed author, speaker, and multimillionaire, has reached this exclusive level of self-discipline in his own life. And he proudly attributes ALL his success to it. Today he's ready to show you just how he got there... and how YOU can get there too! For the first time, Brian is giving you exclusive access to the same secrets and strategies he used and continues to use today. ...like a force of nature." If you stop there, that's already a pretty complete life. But as Brian Tracy will show you, that's only the beginning. Because once you embrace self-mastery, you kick-start a perpetual cycle that automatically brings out your best in everything you do. Each time you use your new heightened level of self-discipline, you increase your self-esteem and self-confidence. As your self-esteem increases, you feel stronger, more powerful, more unstoppable. With new strength, you become more capable of winning no matter what life throws your way. You see, self-mastery drills down to your core and significantly impacts your emotions, your behavior, and your actions, and produces surprising results. Ready to take a peek at the 21 miraculous results you can expect? Once Brian Tracy shares with you the 21 results you can expect through self-mastery discipline, you'll be poised to do far more than simply achieve your goals. You'll achieve a far better life. Find Success: Accomplish far more in your personal and professional life. Build Character: Become the best person you can be. Gain Responsibility: Gain it for yourself, your choices, your future. Set and Reach Your Goals: This one discipline does more to guarantee your success than any other. Achieve Personal Excellence: Your ability to learn, grow, and fulfill your potential is unlimited. Confront Your Fears: You'll take action in spite of any fear. Be More Persistent: You'll make steady, upward progress. Improve Your Work: Advance your career quickly and dependably. Show Your Leadership: Be in complete control of yourself and the situation at all times. Build a Business: Start and operate a successful business in today's economy. Skyrocket Sales: Step on the accelerator of your own ambition to excel in selling. Multiply Your Money: Yes, even in today's economy, you can achieve financial independence. Improve Time Management: This core discipline largely determines the quality of your life. Solve Any Problems: You'll seek solutions for any setback. Achieve Perpetual Happiness: Nothing is more important than your happiness. Enhance Your Health: Live a longer, disease-free life. Embrace Physical Fitness: Feel stronger, more energetic, throughout your day... throughout your life. Have a Courtship-type Marriage: Enter into a long-term, loving relationship benefiting you both. Nurture Your Children: Being a parent is one of the most important jobs you will ever have. Maximize Your Friendships: Fully 85% of your happiness will come from satisfying relationships with others. Enjoy Peace of Mind: It's the truest measure of your success and the key to your happiness. You'll gain the secrets Brian has collected over several decades to achieve self-mastery in each of the 21 important life areas above. He shares each and every one with you in his audio course The Miracle of Self-Discipline: The "No-Excuses" Way to Getting Things Done. Through 21 mini audio sessions, Brian teaches you how to determine what it really is you want in every area of your life. Then he shows you how to blast past obstacles to make it happen—with results that can be described only as "miracles." What's more, at the end of each session, you are asked a series of questions about your own experiences and dreams... like having Brian himself coaching you one-on-one. The answers you give become the stepping-stones to your ideal future! Yes, I'm ready to experience miraculous breakthroughs in 21 areas of my life! I want to order now for a limited-time special discounted price! One of the most miraculous results about developing your self-mastery discipline is that every time you exercise it in one area of your life, you increase it in ALL areas of your life. Increase your chance of success by 1000%! This simple yet rarely used ONE-MINUTE trick practically GUARANTEES that your goals become reality. Confidently accomplish 10x more using Brian Tracy's proven 7-Step Surefire Goal-Achieving Method. Increase your work productivity, performance, and results in JUST WEEKS, not months! Increase your income by 1000% over the next 10 years! Do the quick math in your head. That income may seem impossible now, but not once you learn what's behind this little-known secret. Become the effective leader you always knew was inside you! Simply incorporate 7 principles into your daily life, and emerge as a leader others faithfully follow. Gain a 1000% "Return on Energy"! Discover the 10-minute solution to organize your entire day—EVERY DAY—to achieve 1000% more! Find out if in JUST 5 YEARS, you'll be a LEADER in your company... or STUCK in the same job with similar pay! Easy 30-second math reveals your future. And it's surprisingly accurate! Achieve MASTERY in your field by following an automatic formula! The average person does an average job for average pay. But not YOU! Accomplish mastery in your field and expect master-level income. DOUBLE your sales income! Salespeople take notice—Brian shows you his proven sales call discipline to keep your sales funnel CHOCK FULL! Plus he shares his 6-word solution to a record-setting year. Make yourself indispensable! To your current employer AND to hiring managers. Seven Simple disciplines become your shortcut to REAL job security. Climb into the top 20% of achievers by living the "Iron Law of the Universe." Plus, a full 80% of people RARELY engage in this one critical, yet instantaneous discipline. Practice the 1% Formula—engage this no-pain discipline and retire a millionaire! Plus, Brian reveals his Wedge Principle—a surefire path to financial independence in today's economy. Beat procrastination once and for all and start taking immediate action. Conquering this one discipline impacts your career, income, health, accomplishments, and self-image. Not only will Brian Tracy help you make tremendous headway in your career and financial future, he also shares the discipline secrets that shape your character, your relationships, and your happiness. Unlock the undisputed key to happiness! You'll be on cloud nine as soon as you learn how to connect satisfaction to self-esteem. Plus discover the 5 key ingredients to continual bliss. Smash through obstacles, steer clear of problems, and keep setbacks from slowing you down! Learn the 9-Step Method for solving problems quickly and confidently. Finally lose the weight you want to lose... for LIFE! Just 5 words stand in your way! Plus discover the 7 key habits that contribute most to your longest, healthiest life. Defeat the negative emotions that threaten your dreams! Plus, learn how to destroy the root cause of all unhappiness. Improve your marriage and even gain new friendships! All of your relationships become stronger as soon as you employ the 4 simple disciplines of effective listening. And MUCH MORE throughout Brian's life-changing audio sessions! YES, I want to be UNSTOPPABLE in 21 areas of my life! Please send me Brian Tracy’s The Miracle of Self-Discipline: The “No-Excuses” Way to Getting Things Done — I can select one of two ways of ordering. Learning a new skill: An absolute necessity in today's always-changing job market! Losing weight and achieving vibrant health: You need energy to achieve your goals—and what's the point of achieving your dreams if you're too sick to enjoy them? Getting out of debt, once and for all: Finally, get rid of that crushing burden and put yourself on the road to financial abundance and peace of mind! And this bonus session comes complete with action exercises to accelerate your momentum toward achieving every one of your goals. "For life to get better, YOU must get better." You need only TWO things to improve your life significantly: Discipline and Determination. 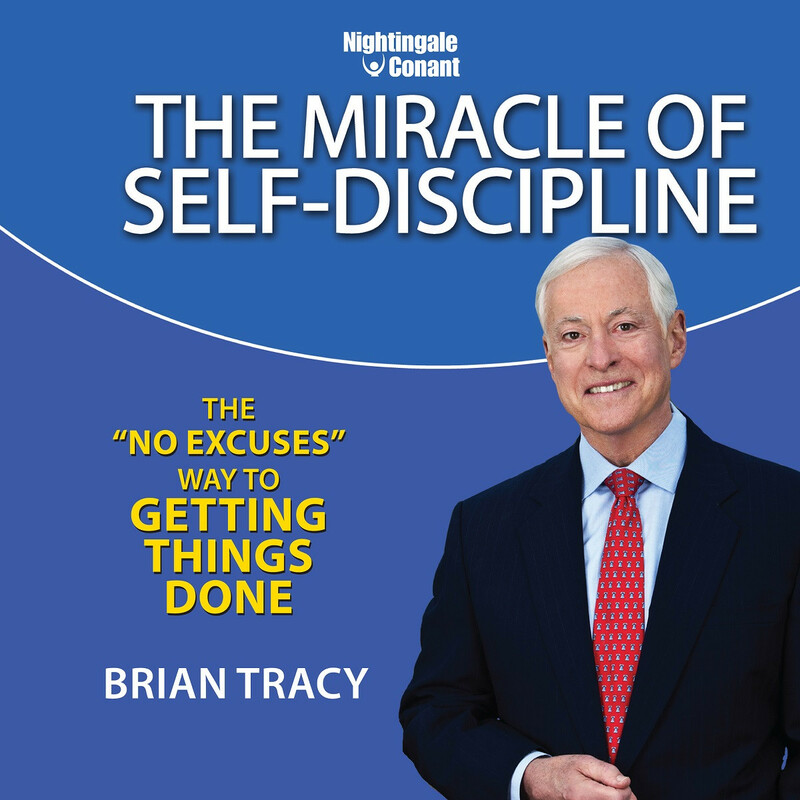 Brian Tracy will give you every tool you'll ever need to make the discipline part of the equation like second nature. It will automatically become a part of your every day routines. The only thing you need to provide is the determination. You have to be hungry, passionate, and ready to change. No one becomes excellent by accident. It requires a definite commitment and lifelong appetite for more. TRY The Miracle of Self-Discipline today! As always, your CD order is completely risk-free because your satisfaction is guaranteed. You can return The Miracle of Self-Discipline for any reason and at any time during the next 30 days. We'll RUSH you a full refund of the course price or an even exchange—whichever you prefer. The digital download version of this course does not include a refund option. Brian Tracy has been a long-time friend to Nightingale-Conant. He's produced multiple best-sellers. All instant classics. But I can honestly tell you there's something special about this one. The reason: It has such far-reaching impact across the entire spectrum of your life. By following Brian's advice, you can expect to see visible changes in 21 separate areas of your life! Go ahead and click on the order link below. I look forward to receiving your order, sending you this empowering course, and hearing about which of your 21 life areas you're improving first. PS: At a recent dinner that I had with Brian Tracy, he said: "No matter how talented you are, no matter how many other skills you have, you'll never get what you want without self-discipline. It is the foundation of all action and achievement." It's true. The life you've always wanted STARTS the second YOU DO. Get started today by clicking on the order link below. A zero-risk proposal with miraculous potential! Brian has traveled and worked in more than 96 countries on six continents, and he speaks four languages. He is an avid reader in management, psychology, economics, metaphysics, and history, and he brings a unique perspective and style to his talks. He has the remarkable ability to capture and hold audience attention with a fast-moving combination of stories, examples, humor, and concrete, practical ideas that get results—fast. Brian Tracy has produced more than 500 different audio and video learning courses covering the entire spectrum of human and corporate performance. These courses, researched and developed for more than 25 years, are some of the most effective learning tools in the world. "I was bankrupt several years ago. I started listening... [and] have made OVER a MILLION dollars!" "I went from being a Sales Manager to becoming a Director of Sales & Marketing in four years, and raising my income by more than 50%!" "I had a new baby and 3 other kids. I was overweight, my husband had left me, I had no job and I was going through postpartum depression. After listening... I lost weight, bought my first new car, started college, and went to work at UPS. Since then, land and home are paid for." "I went from doubling to tripling an already six-figure income to almost seven figures (this year)!"